Begin With Successful Global Trade ! ! Best Global Marketplace ! ! DELIKON Automation steel mill cable protection Delikon Heavy Series Over Braided Flexible Conduit conduit Fittings protect electrical and automation equipment cables of steel making plant. iron plant cable protection Heavy Series Over Braided Flexible Conduit conduit fittings for IRON MAKING AND STEEL MAKING control systems, PLC, drive systems, motors cables. Modern steel mills must fulfill the requirements of high productivity and yield, tight dimensional tolerances, enhanced mechanical properties and improved surface quality. 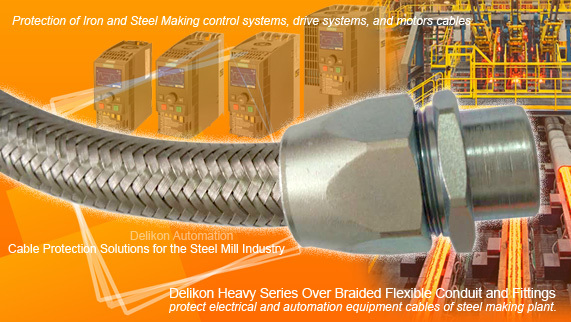 When Converting existing equipment to match new duties, or to improve efficiency and remove process bottlenecks at plants, or modifying existing equipment to improve availability, extend life and resolve maintenance issues, or upgrading existing equipment to leverage current technology and get the best return on existing plants, Delikon Heavy Series Over Braided Flexible Conduit and Fittings are here to provide additional mechanical protection, hot metal splash resistance, as well as EMI sheilding to steel mill automation control and electrical cables. Please log in your ID and password, we will later fill in relating info. Complete this form below to send out your enquiries. All enquiries will be automatically sent to the company you want to develop. Copyright©2019, G.T. Internet Information Co., Ltd. All Rights Reserved.